Get your wands ready and prepare to dive back into the magical world of Fantastic Beasts: The Crimes of Grindelwald! 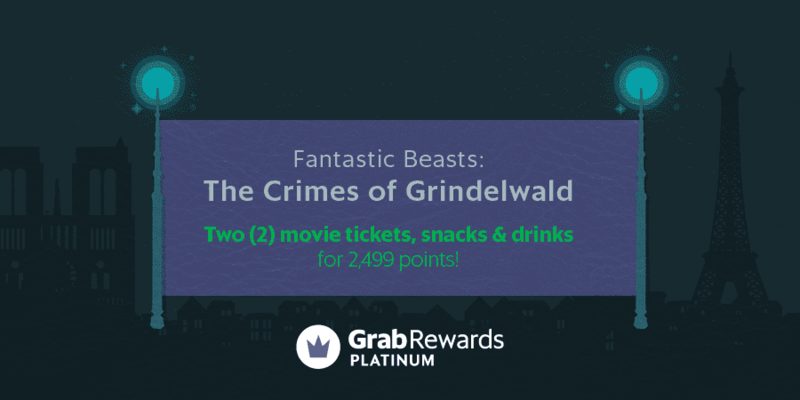 From Nov 11 to 13, Grab Platinum users can get two (2) movie tickets complete with popcorns and drinks for 2,499 GrabRewards points to the screening of Fantastic Beasts: The Crimes of Grindelwald on November 15, Thursday at Uptown Mall Cinema. On November 15, go to the Grab Platinum Station (located at Uptown Mall Cinema area) to claim your movie ticket for the VIP screening. Grab Platinum user must present the redeemed Fantastic Beasts reward to the Grab representative for verification. Value of the Fantastic Beasts: The Crimes of Grindelwald reward is 2,499 GrabRewards points. Promo is valid from November 11 to 13, 2018 or until supplies last, whichever comes first. Failure to redeem the reward within the validity period will render the reward invalid.